I am writing for a friend of mine who has done a remarkable Spitfire conversion but lacks the computer confidence to tell the story for inclusion on "Little cars with big engines". I am attaching a number of images of the car to this mailing. I hope I have not exceeded your capacity to download this message. If so, please let me know and I'll send the images in batches. There are more pix if anyone wants to see them. My friend's name is Larry Breitkreitz and his car is a '73 Spit 1500 which is now powered wtih a Toyota 4AGE engine and 5 speed transmission. Larry is a fine craftsman and perfectionist who is not afraid to tackle the big jobs and is fussy enough to do them several times if he is not satisfied that the work is "done right". 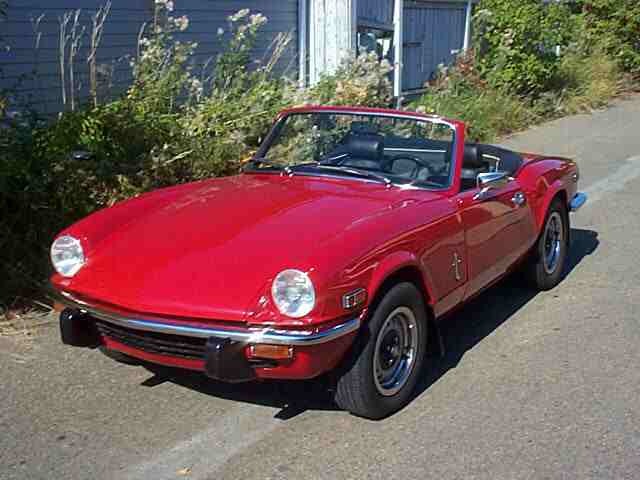 Larry started with a well-used Spitfire which had suffered serious insult by the DPO who had attempted to install a Mazda RX-7 Rotary engine. His tool of choice seems to have been an axe as when Larry got the car the rotary was lying in a large hole, which had been chopped in the firewall and floor, supported only by a piece of wood. Perhaps the fact that the gear shift lever would have been somewhere behind the driver when the job was finished caused him to give up. 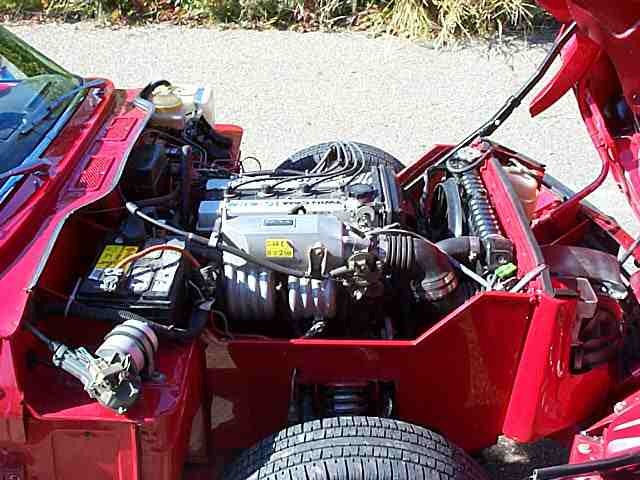 The engine/transmission was obtained from a fellow who was restoring a collision-damaged Toyota Corolla GTS. He needed the body but not the drivetrain. 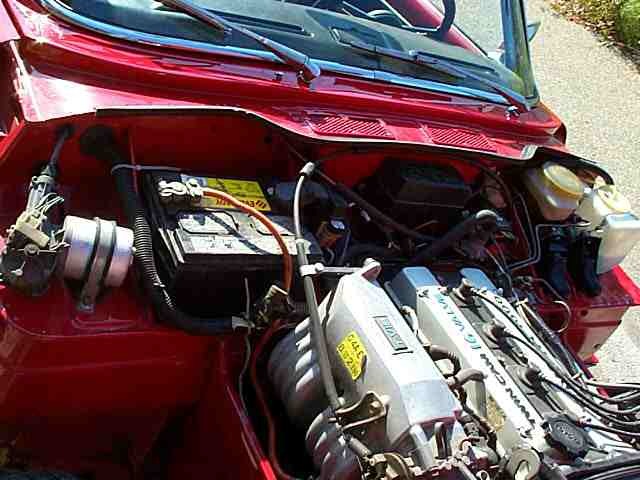 The DOHC, 16 valve 4AGE engine is found only in this car or in the MR2. This a beautiful little engine to use in a Spitfire as it is close to the original displacement (1600cc) but has nearly twice the horsepower as it produces 124 hp. With fuel injection and computer control, the engine is quiet, very smooth and highly economical. It is also lighter than the original and will fit nicely in the car with appropriate modifications. 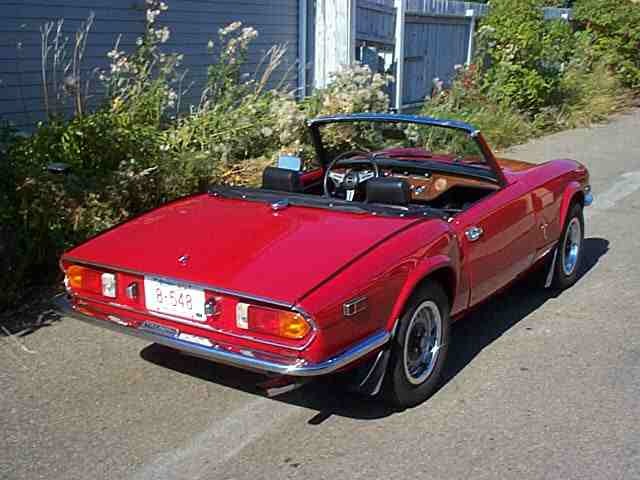 Larry's goal was to have a completely stock-looking Spitfire and in this he was successful. The only clue that the car is not what it seems is the gear shift lever, which is slightly different from stock. Under the hood, of course, everything is changed but to those who don't know Spitfire's the work appears to be "factory-original" (except for the words "Toyota 1600 Twin Cam 16 valve" on the cam covers). The body was removed from the frame which was subsequently stripped completely, sandblasted and painted. The new engine was hung from a chain and suspended above the frame in order to determine the necessary placement. Using trial and error methods the exact location of the engine and the amount of modification necessary was determined. During the fitting procedure, the body was loosely re-fitted as required. The hood was checked for height problems but the everything appeared correct. The crossmember under the engine was cut out and replaced by two new ones. These were fabricated from rectangular tubing and were placed on either end of the area into which the sump would be located. The steering rack mounts were lowered 1/2 inch for clearance. The speedo cable had to be routed through the frame which was plated around the hole. The frame was notched slightly to permit clearance for the clutch slave cylinder. Engine mounts were fabricated using a modified Toyota mount on the right and a new fabrication on the left. These were welded to the frame. The Toyota transmission mount was narrowed and welded into the Spit frame. Corvette air shocks were used in place of stock and were inflated as required. A rear sway bar from a Ford Fox series body was used with custom mounts. The engine was installed using stock Toyota rubber mounts to the fabricated steel mounts. A Mazda RX-7 radiator was installed in a left-offset position using a custom fabricated radiator support/shield. A Pontiac 6000 cooling fan assembly was mounted on the forward side of the radiator and is controlled from the Mazda cooling sensor. 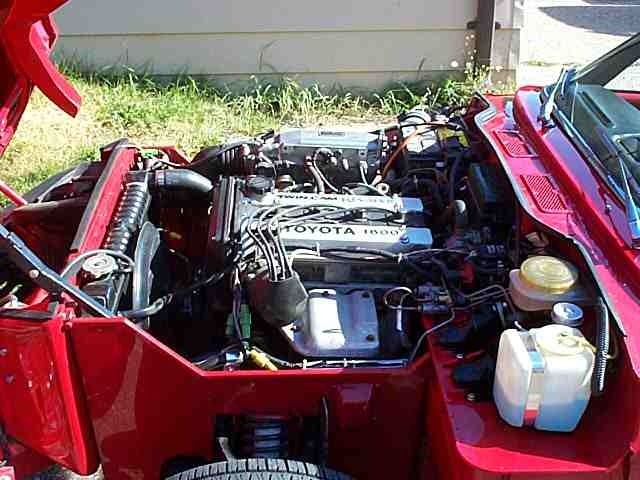 The Toyota oil cooler was used and was mounted forward of the radiator with custom hoses to connect it to the engine. 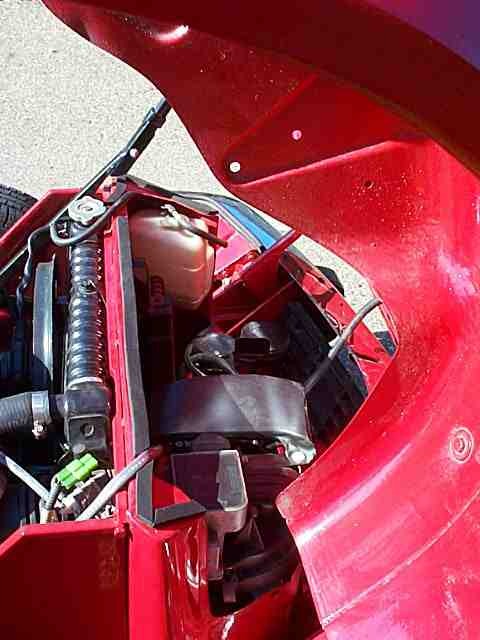 The air cleaner/mass air sensor unit was mounted on the left side of the engine compartment forward of the radiator and connected to the intake plenum using two stock Toyota air inlet tubes. The stock Spitfire cardboard engine shields were replaced with custom fabricated steel and square tubing units which give a very tidy appearance to the engine compartment. Larry made a custom exhaust header from the engine manifold outlets to the pickup for the custom exhaust system which uses a muffler and resonator for quietness. Inside the car, a transmission tunnel was made using steel instead of cardboard. The whole interior and floor was insulated for noise and heat prevention. The wiring was one of biggest jobs as Larry wanted to use the stock Lucas wiring where possible. The Toyota computer was installed inside the car under the dashboard on the left side and all relays, junction blocks and harnesses deemed necessary were retained and mounted in appropriate places. The result is a "Nippo-Lucas" setup. All engine control systems are Nippondenso using the Japanese main relay/fuse box connected to the battery. In-dash wiring and all other wiring is stock Lucas interfacing with the Nippondenso as required - especially at the ignition switch. Dash instruments are stock Spitfire including the tachometer. Everything works properly. 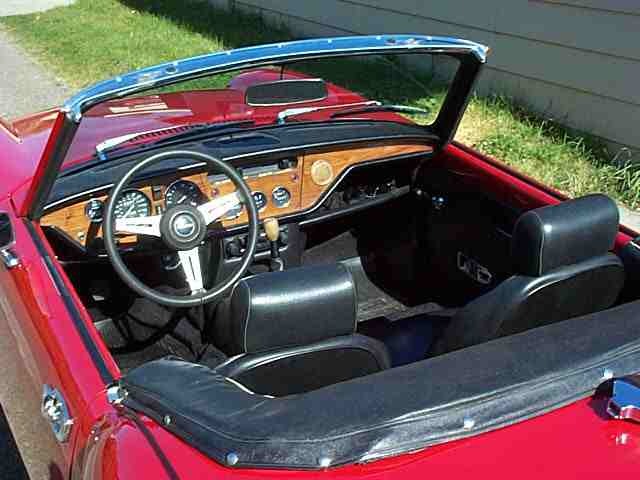 The interior and seats were re-finished using replacement parts from Moss or Victoria British. Seats were locally re-upholstered to the correct pattern, while the carpet was fabricated from scratch in order to fit the modified transmission tunnel. The bodywork was repaired as necessary and painted in acrylic enamel. The color is Honda's "Milano Red". Bumpers were rechromed and original excellent pieces were used to finish the exterior and interior as required. Wheels were powder coated and stock-sized tires were used. The original decals and badges were omitted from the front and sides of the car to enhance the clean lines of the design. The result is a very satisfactory car. It has been driven as much as 650 miles in a day and has attracted great attention at British and other car meets. The car easily averages over 50 mpg (Imperial) when driven at speeds of 70 mph or greater. The five speed keeps the engine loafing along and the powerful and responsive engine makes passing a pleasure. Handling is enhanced because the engine is lighter than the stock unit and the stiffer rear end keeps the whole thing in balance. Top speed has not been tested but it is probably in the 125 mph range while acceleration is very satisfactory. The car is not a hot rod but is perhaps what the Spitfire could have been with a bit more development - a true GT sports car with excellent performance and handling to match.